Amidst the hectic pace and chaos of modern life, we often forget the importance of family. Whether it is the family we are born into or one we build for ourselves, it is love that keeps us together. We must continue to cultivate this relationship if we were to maintain a healthy balance in life. Mid-Autumn Festival is an opportunity for Chinese families to reunite, and my family never fails to celebrate it with a feast. 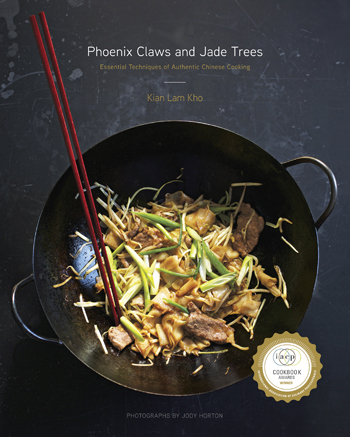 This year, with the upcoming first anniversary of the publication of my cookbook, Phoenix Claws and Jade Trees: Essential Techniques of Authentic Chinese Cooking, I’m expanding my celebration with a virtual feast to include my fellow North American bloggers, friends and food enthusiasts whom I consider as family. 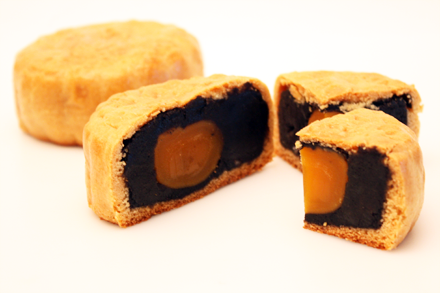 Two weeks ago a Chowhound forum user, Gordon Wong, started a discussion thread and he questioned whether mooncake is like fruitcake: often gifted but rarely eaten. 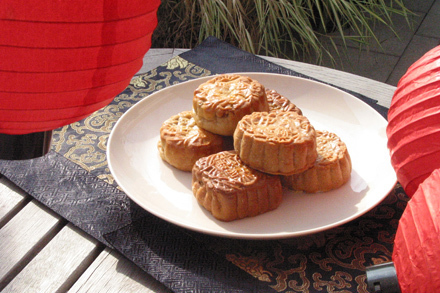 I was pleased to read that majority of the responders reported they love mooncake and do eat them. I too am a fan of mooncake. I like them so much that I often wait until after the Mid-Autumn Festival so I can buy more of them at a discount. A few years ago I happened to be in Shanghai during the Mid-Autumn Moon Festival. Normally during this time of year families come together for reunion dinners. But a few of my expatriate friends from Singapore and Malaysia, and I were posted in Shanghai without our families. 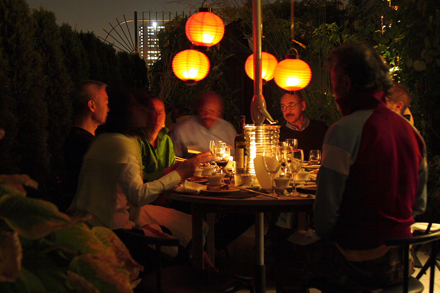 So we gathered up a group and celebrated the festival at a Shanghainese restaurant. As we ordered our meal the waitress suggested we try some pork mooncakes. 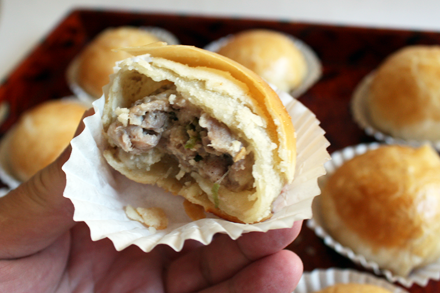 That was the first time I tasted a savory mooncake. I walked into the K-Mart store near Penn Station in New York last week and discovered to my horror that the Christmas section is already fully stocked with artificial Christmas trees, holiday decorations and ribbons. I had to check the date on my New York Times to make sure I had not completely missed Columbus Day, Halloween and Thanksgiving. This senseless commercialization sent shivers up my spine. Just like Christmas in America and the West, Asian merchants have learned the art of commercializing holidays. I was rather surprised, though not completely unexpectedly, to find mooncakes being marketed all over Asia as I traveled in August even though Mid-Autumn Moon Festival (中秋節) is not until October 3rd. 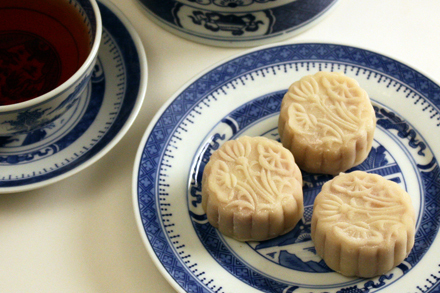 From Kuala Lumpur to Hong Kong and Singapore to Shanghai, neighborhood bakeries as well as multi-national food chains were touting their specialty mooncakes in advertisements as well as by shelf talkers in their stores. 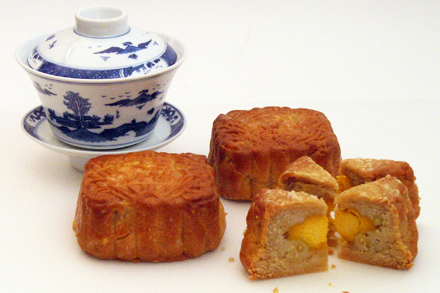 In Chinese cultures the Mid-Autumn Festival is the most anticipated holiday after Chinese New Year. It is celebrated on the 15th day of the eighth month of the Chinese lunar calendar, which fell on September 14th this year. 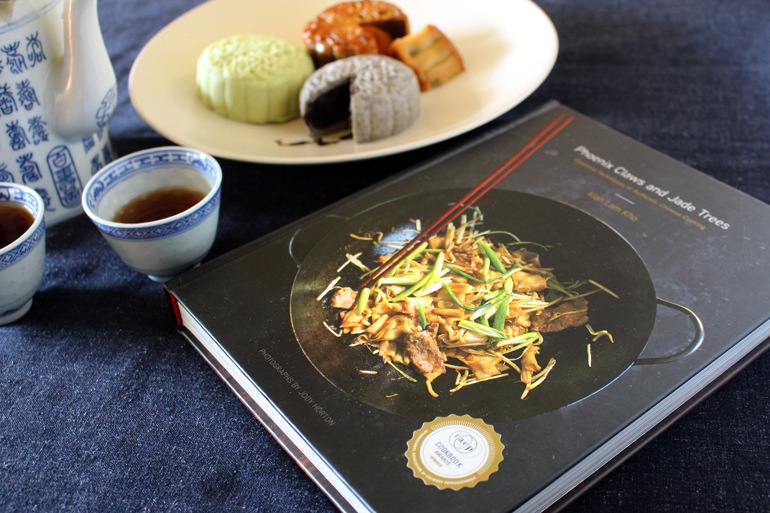 While my family celebrated on that day with a traditional family gathering and an evening of sumptuous food and mooncakes, I am using this opportunity presented by FoodBuzz to celebrate again with my “extended family” in my new neighborhood of Harlem USA. The word is out! 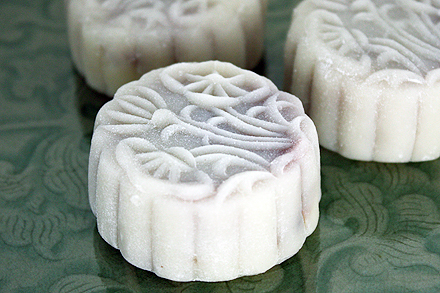 There was a reason why I’ve been working so hard at making these mooncakes. Take a look at what I myself and other bloggers will be doing this weekend. Come back on Sunday, September 21, and read all about it. There are more mooncake flavors to come! After I published my homemade mooncake post, my dear friend Lee Chin Hock, who is now living in Hong Kong, left a comment on my Facebook post. 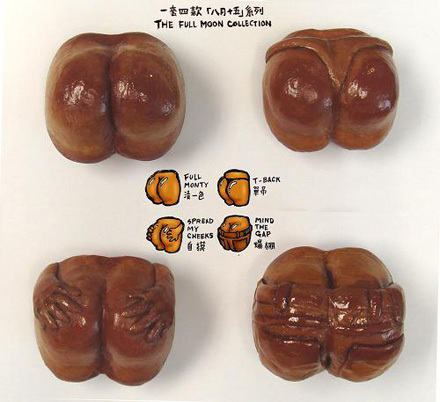 He sent me links to a story and pictures of a collection of “innovative” mooncakes that are all the rage among the young and hip in Hong Kong. All my friends thought I was out of my mind when I told them I was going to make homemade mooncakes. Well you see mooncake is one of those things better left for a professional bakery to make. Making them is time consuming and can be very tricky to handle. But the idea of making them at home intrigued me, and I was determined to make an attempt for the Mid-Autumn Moon Festival this year. In fact I wanted to experiment with more modern and innovative flavors. So, I got on Amazon and ordered two mooncake molds and made my very first homemade mooncakes: Earl Grey Tea Mooncakes with Egg Yolk and Pine Nuts.